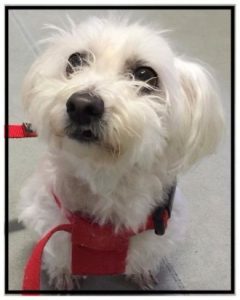 Snowy's Story | East Bentleigh Animal Care. Sweet Snowy is a 12 year old Maltese princess, she had been very unwell, eating less and losing weight over the last couple of months.On examination it was found that her gum colour was pale and her abdomen distended. Blood testing revealed anaemia and inflammation. An Ultrasound revealed a mass in her abdomen very close to the spleen. Surgery was in order, so we operated and had to remove the ulcerated spleen and the attached mass. So we sent the spleen and mass off to the lab for testing and result came back as cancer of the spleen. Not so great news as the pathologist indicated a survival time of only one month with this kind of cancer if it had not spread anywhere else in the body. So far Snowy is doing well, her recent blood tests showed values all in the normal range, so thankfully Snowy and her Owner can continue going for little walks in that snazzy little harnass! Like Us and Follow Us ! !